This pub at Royal Naval Dockyard has a strange name but there’s actually some logic behind it. It’s named after two former owners; John-Paul Magnin from France (the Frog) and his Bermudian business partner Carol West (the Onion). The Frog & Onion is huge and obviously didn’t begin life as a pub. The imposing setting is actually an old barrel-making building. We’d take an educated guess that it’s probably the largest pub in Bermuda. An enormous stone fireplace, which once functioned as a forge, is the centrepiece of the dining room. There’s also a bar, games room and souvenir shop. Out front there’s a pleasant covered patio interspersed with palm trees. Authentic naval artefacts give the pub a distinct sense of history. The Dockyard Brewing Company is attached to the pub and is Bermuda’s only brewery. In fact its beers are one of the only products actually produced on the island (most things are imported). 5 ales are brewed here and are served at the Frog & Onion and a few other outlets around the island. Pub favourites such as North Rock Cornish Pastie and St David’s Lager Fish & Chips more than satisfy visitors looking for ‘Olde English Fare’. House specialities include Fire Charred Yellowfin Tuna and Jumbly Seafood Pasta. Portions are large enough to prepare the most energetic for a day’s exploration of the Royal Naval Dockyard. Had enough of the kids? Give them some quarters and let them while away their time in the games room. It has a good selection of arcade games and is one of the few places in Bermuda with a pool table. The pub is open every day of the week. In the summer it’s open from 11.30 am until midnight. Lunch is served between 11.30 am and 5.30 pm, and dinner from 5.30 pm until 9.30 pm. Entertainment is provided nightly. For details of what’s on check the official website or Facebook page. If you’re a cruise ship passenger you will have no difficulty finding it. After leaving your ship, head towards the mainland, turn right onto Maritime Lane and follow the signs for the Bermuda National Museum. The pub is directly opposite the entrance. Visitors coming from elsewhere can catch a bus or ferry. Bus 7 and bus 8 travel from Hamilton to Dockyard. Through the year there’s a ferry service from Hamilton to Dockyard. In the summer there’s also a ferry to Dockyard from St George. At the start of 2013 the pub was purchased by the Island Restaurant Group. The chain also owns the Hog Penny, Pickled Onion, Barracuda Grill, and Victoria Grill (all in Hamilton). Map showing location of Frog & Onion Pub. My husband and I have been coming to Bermuda for years and we never leave without going to "The Frog & Onion". The food is great-the service so friendly and I never get tired of the setting. On our recent trip this past June 2011 we had the new "Maria Hill" salad. Fabulous and very refreshing. Can’t wait to be back next June! I absolutely love Frog and Onion!!! It has some of the best pub food on the island and it is very family oriented! It is a must eat at restaurant when visiting Bermuda. 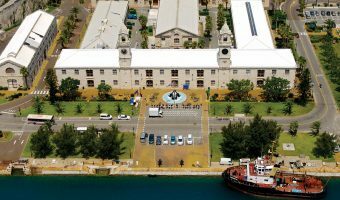 It is located and the Royal Naval Dockyard which also has other activities for adults and children such as Snorkel Park, Dolphin Quest, Neptune Theatre and shopping!! The Frog and Onion is the best pub in Bermuda. The service is perfect, the architecture in the pub is amazing, and the beer is so good. Stop complaining. It’s a good restaurant and this is coming from someone who lives in Bermuda. Had a great time here with the fiancée. We both got blt’s and some drinks. They were amazing. We can’t wait to go back someday. By the way, the service was great. We stopped in here one afternoon while shopping at the Dockyard when our ship was in port. Great beer and a very good hamburger pizza. Friendly bartender and good service. Can’t beat the souvenir glass when you buy a beer. Only complaint was that they closed too early (10:00pm) and we would have liked to spend more time there! We stopped here for the beers and hit happy hour, $4 for pint, which is a great price for Bermuda. We just had fries, but the service was good. Beer was good too. This is a great choice if you are visiting the Dockyard. The food is simple pub food, nothing fancy or over the top. It’s a good place for families because they’ve got a games room for children too. The waitress was very nice and made us feel very welcome. Upmarket seafood restaurant in Hamilton. The bar here offers some of the most creative cocktails on the island. Learn how the humble onion played an important role in the development of the island.